Waking to the 0700 alarm on a dark morning wasn't fun after a week of long lie ins and not wearing a watch. Washed & dressed, I made us a brew and we had a quick tidy around. Our taxi arrived 10 minutes early and we carried our bags down the very narrow stairs out to the road. The roads were quiet and we made the airport in good time, quickly dropped off our bags, passed through security and sat down to read. Travelling with Easy Jet has been surprisingly stress-free - they even have their own Terminal - 2C. We had some breakfast and are currently sat waiting for our flight to be called - the seats are lovely and comfortable, much better than any we've found in any other airport. For the first time since we arrived it's cloudy and the forecast looks similar for several days to come, so I'm glad we made the most of all those sunny days last week. We've had a really relaxing week. We've stayed in Barcelona before, so wasn't fussed about doing the sights, after all the half-built Cathedral is still only half-built 10 years later! Instead we enjoyed living amongst the local community, wandering around the markets, walking by the beach and eating simple, cheap but filling food, with cheap wine and cava. We're not fans of expensive restaurants, where the food and wine is 3 times the price of the local bars. We've tried to speak Spanish all week - Cathy has done very well. But mostly we've enjoyed relaxing and being together during our 30th anniversary week. Our future holidays will all be in our camper van, so no more airports for us - we can't wait. But we've really enjoyed this week and it'll seem strange clinking glasses without saying our holiday toast of '30 YEARS!'. This is our last full day in Barcelona. We both had baggy heads after last night so had a bit of a lie in, heading out for brunch around midday. We walked along the beach and back along the marina road looking for somewhere to have lunch - we ended up at one of the restaurants right on the beach - Xup Xup - still, the long walk cleared our heads. Cathy had ham croquettes to start and I had a warm goat's cheese salad - very French. 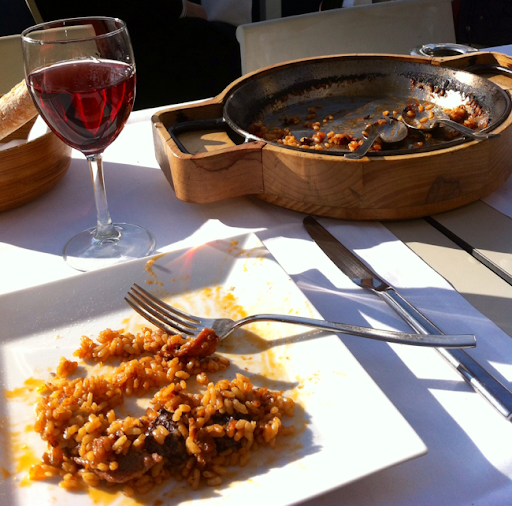 We then shared a seafood, meat & vegetable paella - not that great to be honest. Both full, Cathy went for her daily paddle and we slowly headed back along the beach. By now it was about 3pm, the breeze was chilly and so we went back to the apartment for a brew and a chill. About 5.30pm we walked out just as the sun set over the hills. It was chilly but not windy. We headed for the Barri Gotic area and had a look in a few shops, doing some Christmas shopping; I bought myself a scarf and Cathy some gloves. 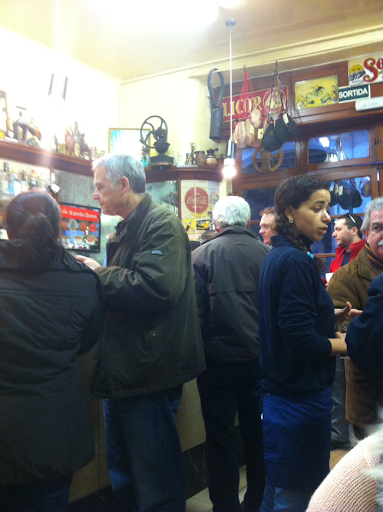 We then found one of the old 'chocolate' cafés - called La Granja - and running since 1872. But first we had to buy some churros. 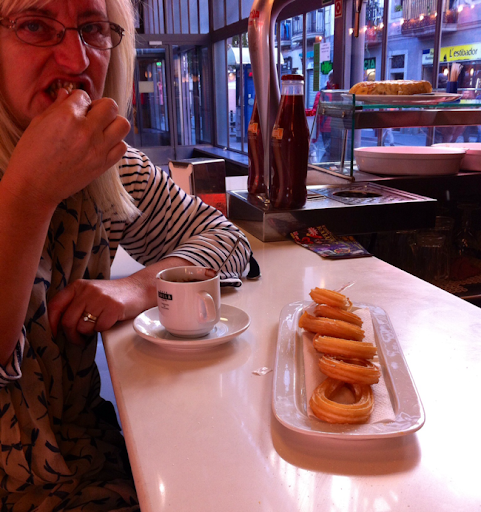 A couple of doors down was a small shop which made nothing but various types of churros. One man was in there buying them buy the kilo. 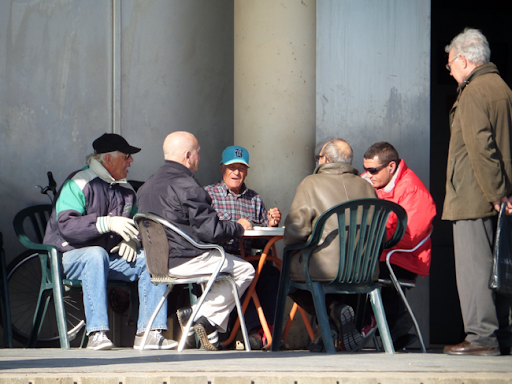 The two old chaps running the place were very jolly as we bought 6 churros for a grand total of €1.20. Returning to the cafe we grabbed a table and ordered hot chocolate. This came in a small glass, filled with very dark, thick chocolate - it was very rich and not too sweet. This went very well with the churros, which we dunked into the thick liquid - lovely! Nicely warmed we headed off to wander through the narrow streets, finally ending up in the Cathedral square. We'd passed here the other day as the Christmas market was being set up, various stall holders building there pitch into various sized wooden stalls, like lots of sheds. It was clear that the building work was still ongoing as only a few of the stalls were open. All were selling various Christmas decorations, mostly very tacky. Some were more religious than others, with small nativity figures. 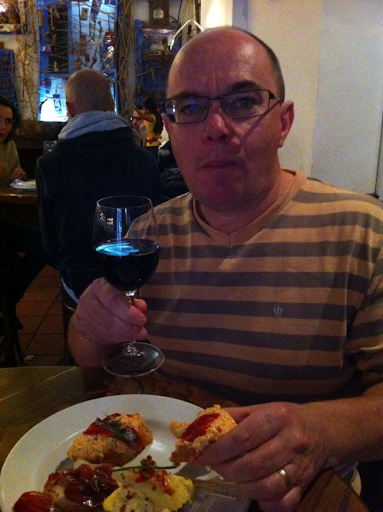 Shopping and wandering done, it was tapas time! Even before the last two items came we realised we'd ordered too much food as the portions were huge! We ate what we could but left quite a lot. A local family sat next to us were tucking in to whitebait, baby cuttlefish, bacalao, snails and salad. We paid our bill and headed out into the cool night, looking forward to resting our full bellies back at the apartment. We stopped on the way to buy some fizzy water to aid our digestion! Back at the apartment, packing done, we headed to bed for an early night, ready for our taxi in the morning. 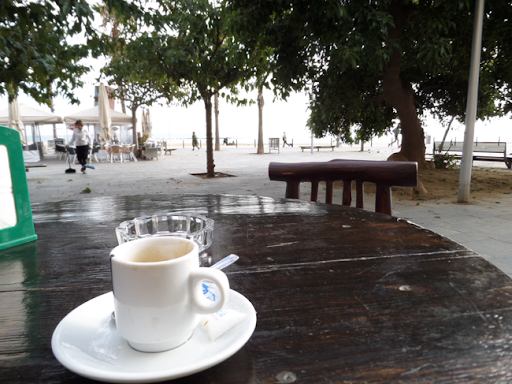 Our day started lazily and we eventually wandered out for a walk along the beach. Breakfast was enjoyed at the local indoor market at one of the small cafés in the corner. We both had egg, sausages and white beans cooked in oil and garlic - delicious. We carried on with our walk, stopping for some fried baby squid and a cold beer. We walked right down the the Olympic village, which is starting to show its age. 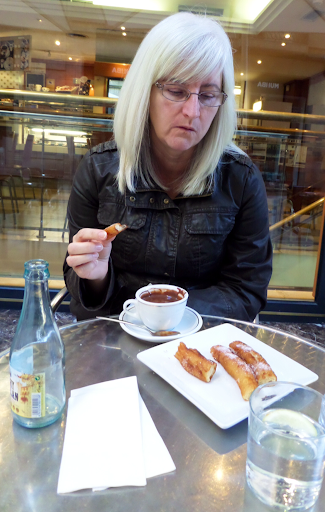 On our return journey we again stopped off at the market cafe so Cathy could enjoy some of the thick hot chocolate, with freshly fried churros to dip in - I had a glass of cava. The owner asked us in Spanish where we were from. When we told him Manchester all the football links came out - how Chelsea are good but Mourhino is a very bad man! Their famous Bomba - potato and meat balls covered in breadcrumbs and deep fried - these came with a fiery hot sauce. All of this was delicious, served and eaten quickly, with a great noisy buzz around us. At some point a local came and took the spare chair on our table, said hello and ordered his own one man feast. What we took to be the mama & papa came in later; papa grabbed a chair to watch the goings on, mama inspected the bar and kitchen before herself sitting down by the kitchen. Still feeling a bit peckish we ordered some broad beans and local sausage. The beans were very soft and cooked in red wine, garlic & paprika, the sausage was hot, peppery and very meaty. Pleasantly full, we enjoyed the atmosphere and food, although Cathy thought it a bit greasy (lashings of olive oil was used) and said the kitchen cooking oil smelled a bit old. But still a great experience. We then nipped next door to Bar Ke for a drink and a chat. 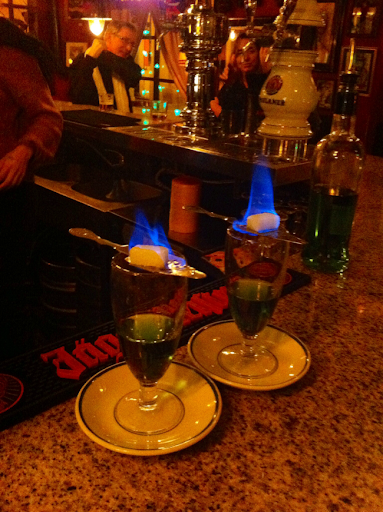 We'd also heard of an Absinthe Bar a short walk away; we'd never had this so thought it would be fun. 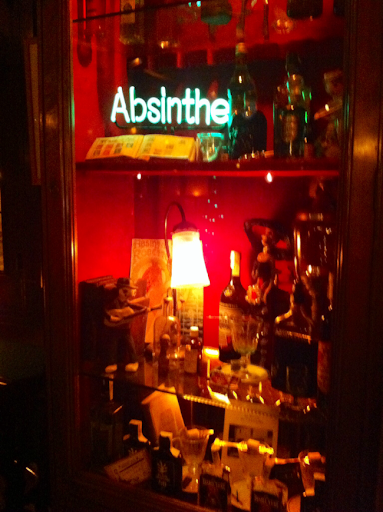 The bar was very dark, 'bo-ho' and a bit whacky - it fitted the Absinthe atmosphere perfectly. 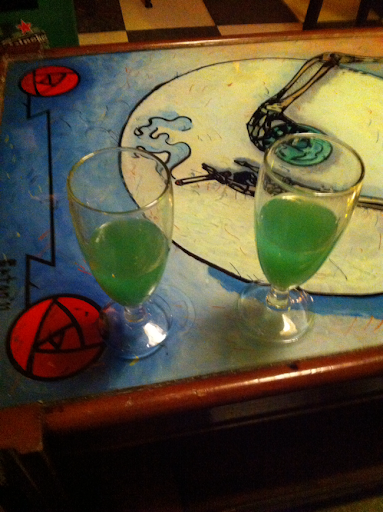 We told the bar waitress that we hadn't had Absinthe before, so she explained and showed us how it's made and started us off with a weaker one that they make themselves. It all felt a bit furtive and naughty. This one we found a bit weak so next time asked for a stronger one. Wow, was it strong! After a glass of this we both felt a bit out of it, Cathy's lips and throat felt anaesthetised and we were both a bit giggly. We don't remember leaving there nor the walk back, and both woke this morning with massive hangovers. It was an experience but probably a one-off for us! We should have walked on past! oooh - it's slipping down rather too well! I left Cathy snoozing this morning and popped out for some victuals - eggs, mineral water and bread. Breakfast done we took the short (1 minute) walk to the beachside promenade and spent an enjoyable hour sat in the warm sunshine. 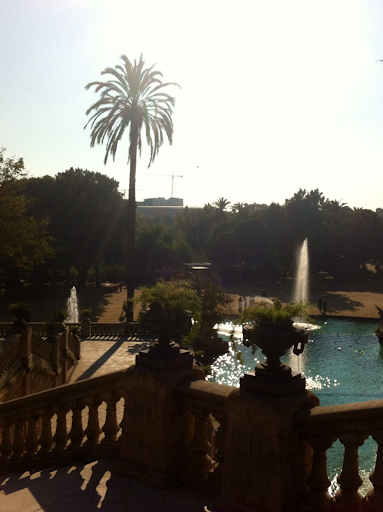 We returned to the apartment to pick up a couple of things and headed off to wander around Parc Cuitadella. 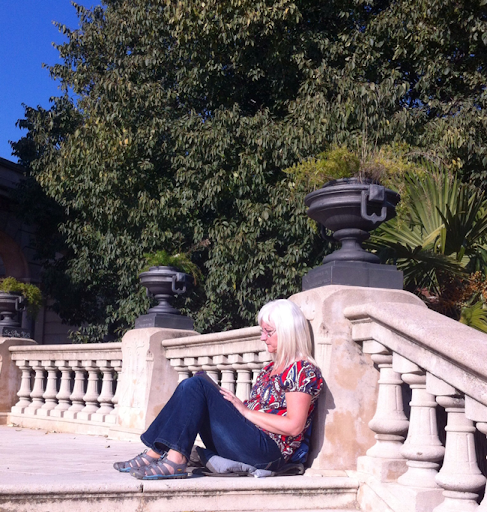 We found a sunny spot on some steps and sat there for half an hour just chilling out. Feeling a bit peckish we returned to Mercat de Santa Caterina to buy some of the excellent Iberican ham - 5J - that we had in Lanzarote, then carried on to Mercat la Boqueira. We walked around the food stalls, planning to stop at one of the little bars for some tapas, but they were all very expensive (tourist Central), so instead we decided to try a glass of Cava (Cathy) and Rioja (me) at one of the 'try before you buy' wine merchants (how civilized!) and look in our little book for a lunch stop. A place called Elizabet's looked OK - local home-cooked food and only a short walk away. We went in and grabbed a table. The menu was all in Spanish but we managed to order OK. Cathy had a ravioli starter and I had eggs baked with tomato sauce and chorizo - both very tasty. For main Cathy chose veal cheek on the bone with chips, I had a beef stew, again both excellent. The service however, was chaotic, each one of the 3 waiting staff served us, none of them knew what we had ordered! 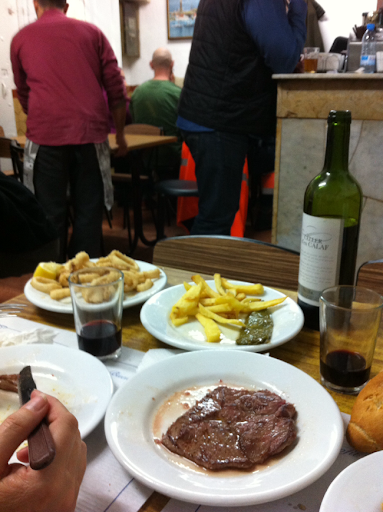 In the end a two course meal with a bottle wine came to €20 - not bad for the centre of town. When we left the bar it was decidedly colder with a strong easterly wind. 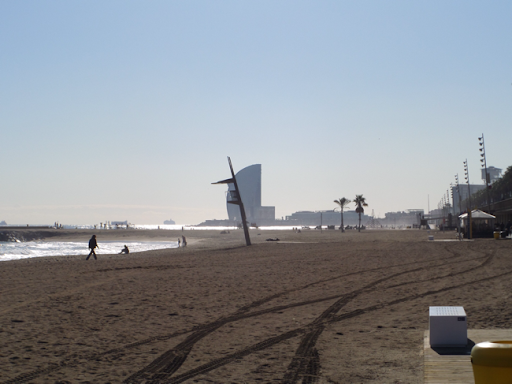 We quickly walked back to Barceloneta, stopping for a very tasty ice cream on the way. Turning the corner of our apartment block we could see that the sea had whipped up in the wind, the palm trees were bending and a sandstorm was blowing a hooley, so we ducked back into the apartment for a brew. Our intentions of heading out tonight for a bite to eat have probably been thwarted by a combination of the weather and a larger than planned lunch! So we're planning a quiet night in watching TED talks on the iPad - rock & roll! I know exactly what she's thinking...."I want to swim in there!" 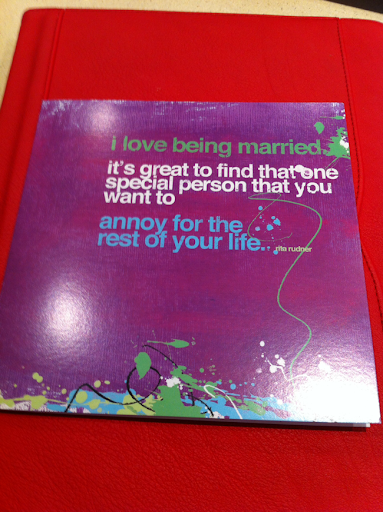 Today is our 30th wedding anniversary - hence the title of these blog posts. During this week we're also saying "30 Years!" as a toast when we clink glasses! 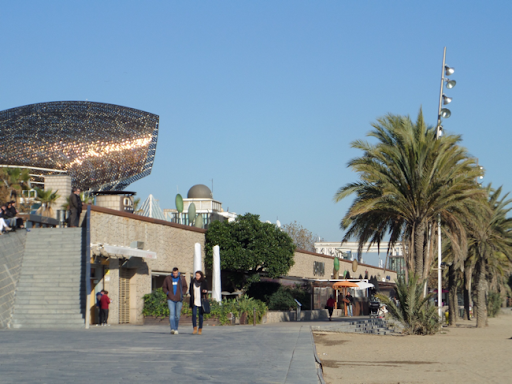 After a lazy start to the morning, our plan was to head to Mercat de Santa Caterina to buy some lunch gear and then walk to Parc Cuitadella for a picnic in the sunshine. We had a good wander around the market, which was the usual high standard for any market outside of the UK - great food, fresh fish, fruit and prepared salads and meals. On the way around we decided to scrap the picnic and instead head into the city for some lunch. 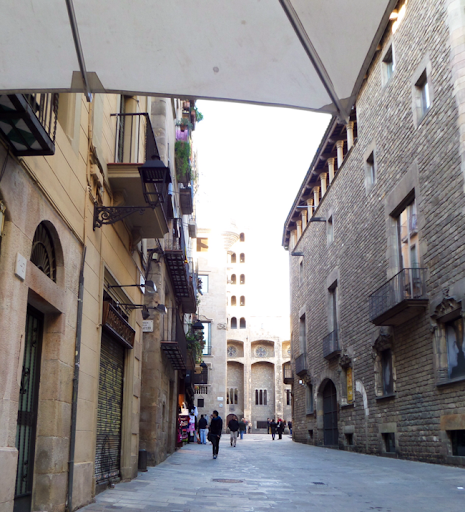 As we were quite close we walked past the Picasso Museum and into El Xampanyet, one of the city's best known Cava bars. We ate here on our last visit 10 years ago and it was just the same, the only thing missing was the sawdust on the floor. We shared a small bottle of Cava and enjoyed a mixture of tapas chosen by one of the waiters - mainly raw fish, ham and tortilla - all delicious. 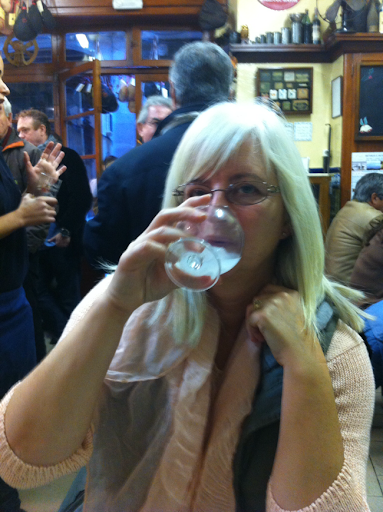 Cathy also tried the local Anis liqueur. I think this was a lot stronger than she expected as she was quickly quite giggly! After this we headed across the very narrow street to try some Basque pinxtos at Euskal Etxia, food perched on top of pieces of bread. We helped ourselves to a few pinxtos but found this place a bit pretentious and the food was a bit similar and bland. 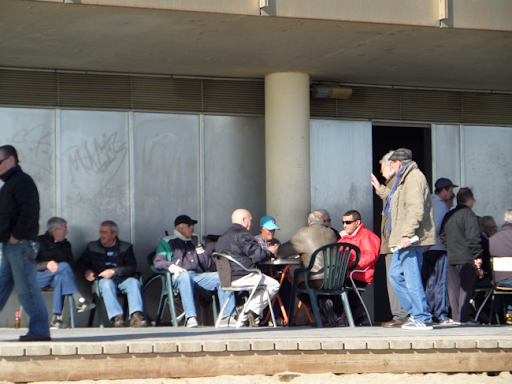 So the plan then was to return to 'our' local area - Barceloneta. 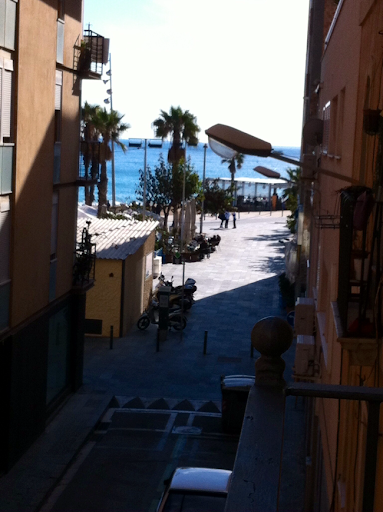 We were walking in Barceloneta down a narrow street near the market and heard some Latino-style trumpet music. Across the road was a small bar called Can Mano. It was good that we arrived when we did as within a few minutes people were queuing outside this small bar for a table. Very much a family run place, the food was simple but very tasty with a menu of mainly seafood, but with some great meat choices. They spoke no English but we got by. 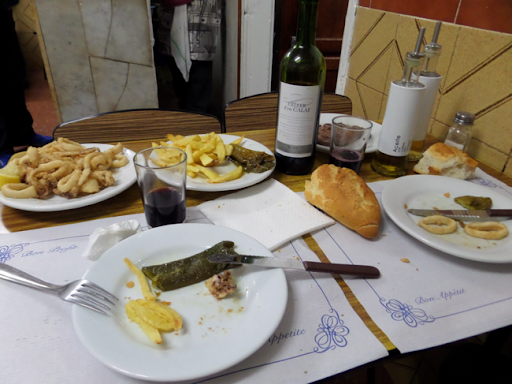 We ordered a bottle of the local wine at just under €4 a bottle, plus fried calamari, fried green peppers, potatas fritas and some veal. Not the healthiest of meals but it was lovely. 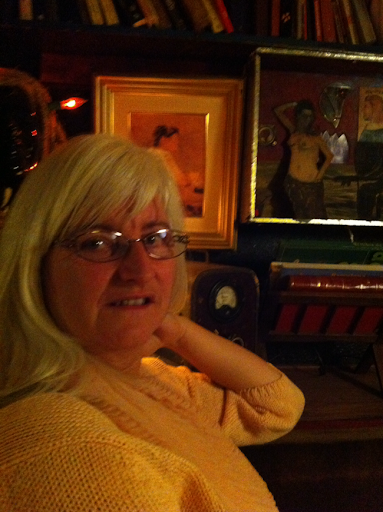 It was a very informal place with a great atmosphere, exactly the sort of place we like. After all that food (and wine!) we were ready for a siesta, so crashed out for a couple of hours, before heading out into the evening for some fresh air and a walk along by the beach. Now settled in with a brew and watching some Spanish TV - to try and learn some new words - we've really enjoyed our day. We don't need expensive restaurants or hotels in order to enjoy our 30 year milestone - we just need each other! Lunchtime Anis - squiffy early! We were up and out by 1030, enjoying the clear blue skies and sun as we walked down to our local indoor market. Employing our few words of Spanish and lots of pointing, we bought ham, cheese, red pepper, onions, figs and croquettes, plus a bauguette at the bread shop opposite. After a cappuccino sat in the sunshine, we took our purchases back before heading off for our morning beach stroll. 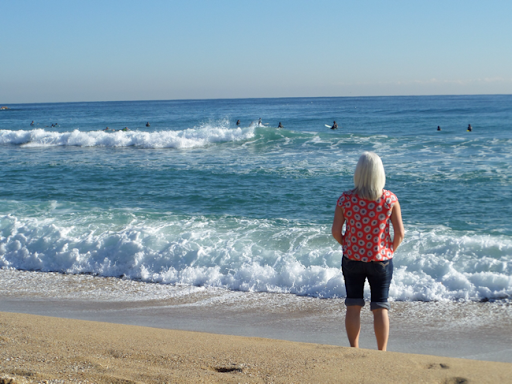 Cathy had a paddle and we stood watching the surfers. We returned to the apartment for a lovely lunch before our trip into the city. We walked along the marina to the bottom of Las Ramblas and headed a little way up before cutting across into the narrow, medieval streets. We eventually found our way to the Picasso Museum (shut on Monday) and the small delicatessen we remembered from 10 years ago. Here we bought various kinds of tinned paprika and some saffron. Wandering back through the narrow lanes we stopped for a drink - Cathy had hot chocolate and churros while I was good with a mineral water! We followed our route back to the apartment to grab our books and went to sit in the beach to read and enjoy the afternoon sun - lovely and warm for late November. We're really enjoying these lazy days with nothing planned, just deciding what to do as the mood takes us. We returned to the apartment for a brew and read before heading out for dinner. We walked down to El Vaso de Oro again for tapas and beer. We started with some almonds, plus some spicy tuna with slices of fried bread, then tried the chorizo & pork and some very spicy patatas bravas. On the walk back we stopped off at Bar Ke for a couple of glasses of red wine. 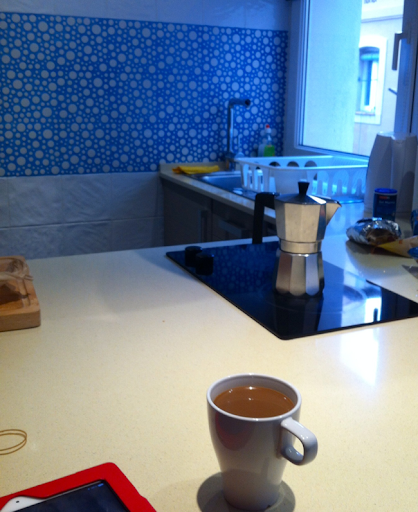 Back at the apartment we had a brew and watched the Spanish version of wife-swap. We only caught the odd word but got the gist of it! And so ends another relaxing day. We woke quite late and after breakfast headed out to walk further along the beach. Many of the locals were out enjoying the (what felt strong to us) morning sunshine. This included some brave souls surfing, although they were all wearing wet suits. 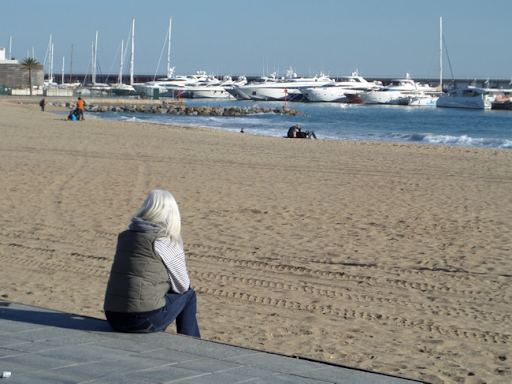 We walked up to the marina and back, stopping a few times to sit and enjoy the sun on our face. I'd read about a good local bar not far from where we were staying - El Vaso de Oro. 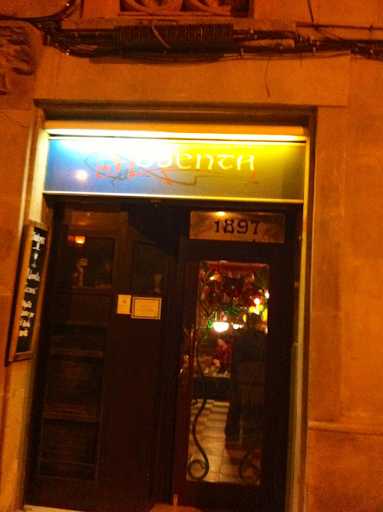 We found it and headed into a typical Barcelona bar - long, very narrow and full of noisy locals! Many were sat on bar stools and the tapas was spread out along the bar - it looked absolutely delicious but, as we wanted to eat Paella, we just had a beer. They also brew their own beer so we will definitely go back there. 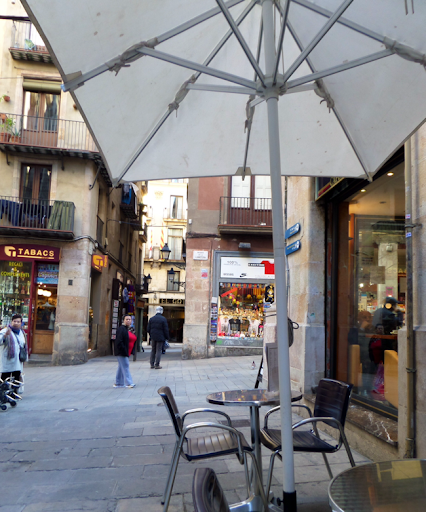 We moved off to grab a table at l'Arros, a restaurant along the Passeig Joan de Borbo. Sitting in the sun and enjoying a glass of Cava, we ordered our food. Cathy had squid and I had some fish croquettes, which we shared as a starter. Our shared paella was Iberian pork, black pudding and chorizo and it was delicious! Cathy finished with Creme Catalan and I had a coffee. Our busy few weeks had caught up with us so we headed back to the apartment for a snooze........waking up the next morning! 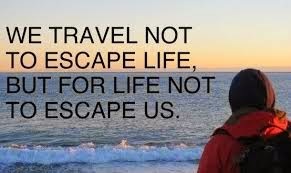 When we talked about where we wanted to spend our 30th wedding anniversary, we had ideas of going far flung - perhaps New Zealand, or maybe a week on safari in Tanzania, followed by a week on the beach in Zanzibar. But in the end, and saving to buy our own campervan, we decided to return to Barcelona, where we had celebrated our 20th wedding anniversary. I had a number of loyalty points on a credit card which covered our return flights and baggage. 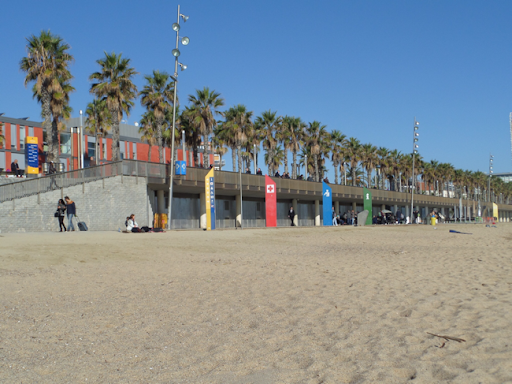 We prefer to live like locals when travelling, so booked a small apartment in an old but refurbished block in the fisherman's quarter of Barceloneta, about 50m from the beach. Saturday morning at 0430 was clear and frosty as we made our way to Liverpool airport for our flight to Barcelona. I was a bit uncertain as we hadn't flown Easy Jet before, but the experience was painless and stress free. I suspect all the horror stories we see on TV are caused by those who lead disorganised lives and just can't turn up on time. The flight time was less than two hours and with a tail wind we touched down 10 minutes ahead of schedule. Quickly through passport control and baggage collection (why can't British airports be this efficient? 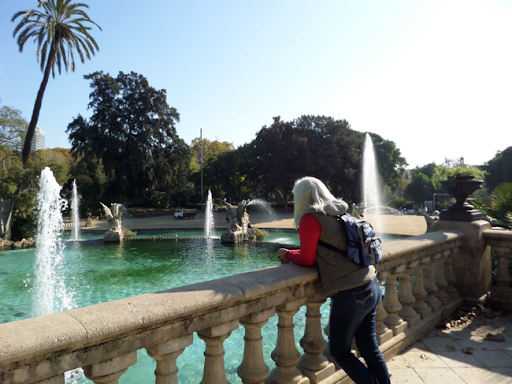 ), we jumped on the Aerobus to Placa de Catalunya and from there took a short taxi ride to the apartment. Paperwork and financials sorted, we headed off for a stroll along the beach promenade and to soak up what we hoped would be the first of a week of early winter sunshine. First stop was a beach-side bar for some tea for Cathy and a beer for me. We then wandered along the promenade before heading in to explore some of the narrow streets between these old, tall apartment buildings. 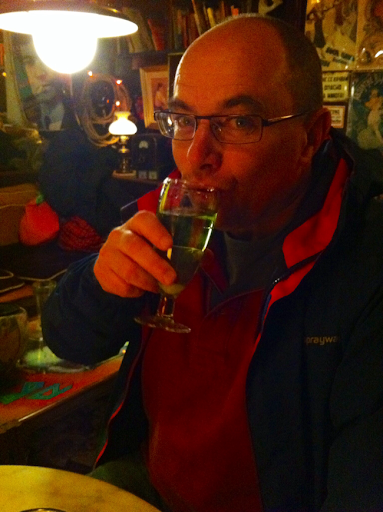 We eventually came across a small bar called Chito's. It was busy with locals so we headed in and grabbed a corner table. 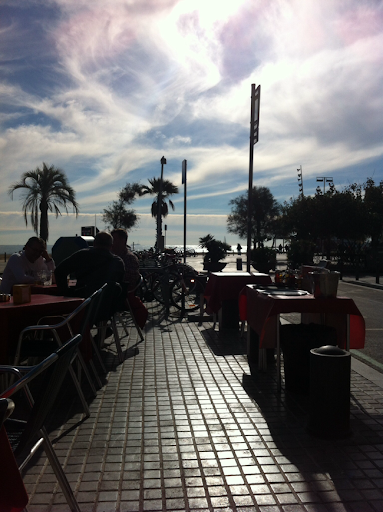 Beers ordered, we sat and soaked up the atmosphere while thinking about which tapas to try. Cathy was keen to try out her Spanish and did very well, although we both knew that the majority of people here speak Catalan, which is closer to French in some ways. We ordered Calamari, fish croquettes, and some local cheese with ham. All was basic but very tasty. After this we popped into a few shops to get some basic provisions for the week and headed back the the apartment for a snooze. We headed out at about 8.30pm, walking along the marina to Las Ramblas. This was really busy so we cut through to walk around some of the narrow streets of the Barri Gotic area. Although 9pm many of the shops were still open. We were both feeling a bit weary by then, so made our way back to Placa Reial, one of the larger squares off Las Ramblas, with bars and restaurants all around the edge. We sat down and enjoyed some wine with a little more Tapas - this time meatballs, garlic prawns, patatas brava and bread with tomato. After a chilly walk back we crashed out after a long first day. I really hope none of us will ever need to contact the emergency services when travelling abroad. The stress of accidents or ill health are bad enough without the need to get your message across in an emergency. I can't guarantee the words and phrases are 100% accurate, but they are close enough to allow you to get your message across either on the phone, or pointing to key phrases if dealing with a local speaker. Please feel free to share this as widely as you like. I've printed off a colour copy, laminated it and keep it in an easily accessible place in our campervan.